FRED DE SAM LAZARO (guest anchor): For many people struggling through these hard economic times, the church has been a place to find solace and — for some — a food shelf. However, when it comes to paying the light bill, the phone bill, and the mortgage, some churches are finding themselves as hard-pressed as their congregants. While charitable giving to churches actually went up overall in 2008, many worship communities have been forced to lay off employees. Some even face the threat of foreclosure. Saul Gonzalez has this report from Southern California. SAUL GONZALEZ: At the recent worship facilities conference and expo held in Long Beach, California, the business of marketing to places of worship was on full display. 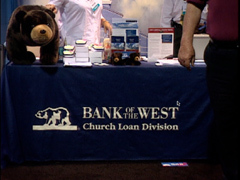 At this twice-a-year national convention, companies try to sell their products and services to churches and religious institutions. UNIDENTIFIED SALES REPRESENTATIVE #1 (speaking to conference attendee): Maybe two cameras to cover the minister and the choir? 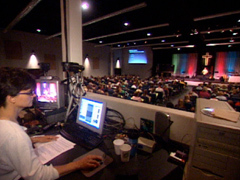 GONZALEZ: Their wares range from sophisticated video production gear to pews for churches and synagogues. UNIDENTIFIED SALES REPRESENTATIVE #2: This is the Cadillac. This is our theater seat, a completely wooden theater seat. GONZALEZ: Banks and credit unions that specialize in lending and financial consulting to houses of worship also attended. UNIDENTIFIED BANK SALES REPRESENTATIVE (speaking to conference attendee): We don’t necessarily go by loan to value. We’re looking at cash flow. GONZALEZ: Although there was plenty of hustle and bustle on the convention floor this year, the recession cast a pall over this expo. STEVE KROH (Architect): In 25 years, it’s never hit us this hard before. GONZALEZ: Steve Kroh is an architect whose firm specializes in church design. With congregations cutting back on expansion and new construction plans, Kroh is seeing his business plummet. Mr. KROH: We’re not having to lay off a lot of people yet, but we’re cutting back on hours and just trying to hang in there right now. We are taking a lot smaller projects than we used to just to keep everybody busy. ERIC KNOWLES (Founder and CEO, Church Brokers, San Diego, CA): The recession is hitting everybody, and it’s affecting churches just as much as it is the mom and pop homeowner. GONZALEZ: Eric Knowles is the founder and CEO of Church Brokers, a San Diego firm that specializes in church real estate and financing. Mr. KNOWLES: Right now, most of the churches we’ve been working with, probably the past year or least, they are all pulling the reins in. They’re not spending anything outside of the hard fast debt they have to pay. Salaries are getting cut back. People are getting let go. A lot of churches are letting their staff go or reducing their pay, going to part time. So it’s a challenging time for churches right now. GONZALEZ: One house of worship struggling to keep its doors open in the down economy is Long Beach’s Immanuel Church, which is part of the United Church of Christ. Reverend JANE STORMONT GALLOWAY (Pastor, Immanuel Church, Long Beach, CA): Foreclosure is a possibility and something that we are concerned about. GONZALEZ: And to those out there who think of churches as being foreclosure-proof? Rev. GALLOWAY: Oh, no. Forget it. GONZALEZ: With revenues down, Reverend Jane Galloway’s church is struggling to pay off a more than $850,000 mortgage and loans used to pay for repairs of this more than 80-year-old building. Rev. 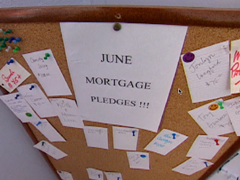 GALLOWAY (speaking at meeting): Talking with the mortgage — our mortgage broker. . .
GONZALEZ: To stay afloat the church has cut expenses, and Reverend Galloway has volunteered to slash most of her own pay. But despite the belt tightening, every bill that arrives brings a new challenge. Rev. GALLOWAY: I mean we’re literally at a point where my husband walked in the other day and said this was on the side door, and it was a turn-off notice for the utilities. Now we are at a scary moment, and we know that each month, if we are unable to make our mortgage payment on time, we could be — the default process can be filed and a foreclosure proceeding could begin. GONZALEZ: Although no single, hard number exists, banks and credit unions that lend to houses of worship report a steady increase in church bankruptcies and foreclosures. 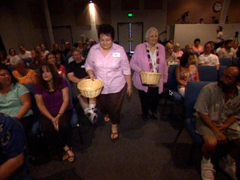 One of them is this 1,000-seat church north of San Diego. Built just in 2005, it closed last year after the church defaulted on loans. Even wealthy and powerful megachurches, such as southern California’s Crystal Cathedral, have had to cut staff and put millions of dollars worth of property up for sale to help pay off debts. Whether they’re big or small, many churches’ money troubles stem from s steady decline in giving. According to the Christian research company the Barna Group, American churches got between $3 and $5 billion less in donations than they expected to receive during the last quarter of 2008. That’s about a four to six percent decline. Reverend PHIL HERRINGTON (Pastor, Pathways Community Church, Santee, CA, addressing congregation: I thank you to so many of you who have given faithfully using this envelope. It really helps us pay the bills and do what we do as a ministry — in helping people and loving God and loving people. GONZALEZ: Phil Herrington is pastor of Pathways Community Church in Santee, California. Rev. HARRINGTON: We have a number of people in our church right now that are unemployed, that have lost jobs. People who used to be significant donors in the church have just flat out lost their income. Maybe they can give in a smaller way, but that affects our overall income. GONZALEZ: In response, Pathways has had to cut staff and fill more positions with volunteers. Houses of worship that face foreclosure and other financial troubles often get into their predicaments for the same reasons that homeowners and consumers do: borrowing and spending too much money when times are good and not being prepared when the economy goes from boom to bust. Mr. KNOWLES: You know, churches are no different than, literally, business owners or homeowners. 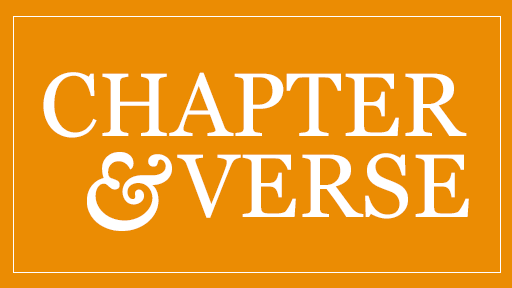 We all believed that everything was going continue to appreciate, that there was no turning of the curve, and so everybody was overleveraging, and churches are no different. They were not exempt. GONZALEZ: Real estate broker Eric Knowles, a devout evangelical Christian, says churches’ financial problems are sometimes made worse by leaders who are unable to face harsh economic realities. Mr. KNOWLES: There’s that faith, you know, that often we think that the Lord is directing us to go do something. Well, how do you refute that when I deal with a pastor that says that the Lord is calling me to buy this building? And I have many situations where it will not pencil. We run our analysis and we get real involved and detailed. But then the pastors continue to say, well, I believe God is directing me for this. Goodness. So what do you do? What do you do? We give the best counsel we can. We give it to them pragmatically, you know, documented in writing that this is where you are going to be, and often time the pastor will look me in the face and say, well, you know what? I understand what you are saying. I understand by earthly standards this will not work, but God has called me to do it. And that’s the trump card. What do you do? You’re just kind of like, okay. GONZALEZ: In both good economic times and bad, some churches are supplementing what goes into collection baskets by finding new and creative ways to raise income. For instance, with assistance from investors Pathways Community Church purchased this once dilapidated shopping mall. The church occupies the space that was once a supermarket but rents out the rest of the center to other businesses. The revenue earned helps the church pay operating expenses and mortgage payments that total over $21,000 a month. Rev. HARRINGTON: Right now it’s helping us survive. If we didn’t have that right now we would have to massively downsize staff and personnel and do a lot less ministry out in the community than we are doing right now. So it has opened up a lot of doors for us. Rev. GALLOWAY (speaking at meeting): I think it could be shared space, perhaps like a collective office space . . .
GONZALEZ: But as they try to guide their churches through turbulent economic times, the strain is taking a visible toll on some religious leaders such as Reverend Galloway. Rev. GALLOWAY: I really want this to work, and I feel a sense of responsibility. I’ll let myself be this vulnerable because you are asking me this. I feel a sense of responsibility to the people I am here for. People come here with broken hearts. People come here looking for food — looking for spiritual food, and I hear the kind of despair they are in, and I realize that it’s crazy for me to be this preoccupied with the finances of some place, when I’m here to create a place where people can come and find solace. So I feel a sense of responsibility to the people who come here for that kind of nurturance. GONZALEZ: At the expo, those attending hoped the recession would soon end, allowing houses of worship to focus not on their money problems, but on their ministries. For RELIGION & ETHICS NEWSWEEKLY, I’m Saul Gonzalez in Long Beach, California.